An engaged citizen is local government’s partner in reaching its goals for effective and affordable service delivery. But it takes leadership and vision to create the path to success. Plus a new approach to using technologies like cloud, devices and modern applications to reach citizens. An engaged citizen is local government’s partner in reaching its goals for effective and affordable service delivery. But it takes leadership and vision to create the path to success. Plus a new approach to using technologies like cloud, devices and modern applications to reach citizens. 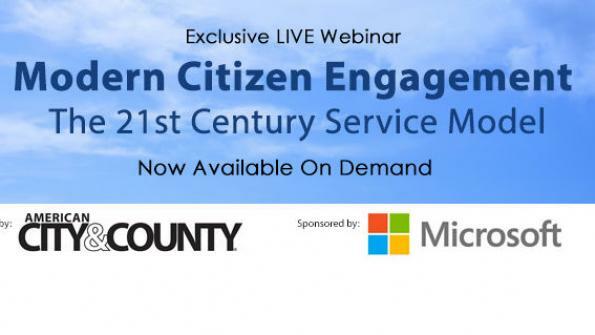 American City & County and top government thought leaders share their successes and vision for Citizen Engagement in this free 1-hour webinar. You’ll hear from innovative San Jose CIO, Vijay Sammeta, Harvard Professor and Author Stephen Goldsmith, and Microsoft’s eGovernment solutions expert Kim Nelson. How the City of San Jose engages citizens today, giving great insight into the future. 4 Keys to future government responsiveness via civic activism, compliance and more. Creating efficiencies and saving taxpayer money using digital tools and the cloud. Applying data-smart governance to predict and pre-empt problems. Please register now to view this webinar on demand.